Sorry for posting twice, I JUST posted this in my own Youtube Videos thread however I thought it might get overlooked and thought it would be of interest in this section since it is specific. Hope that's cool. THANKS. Intellivision & Colecovision UNBOXINGS ! *Contents may differ according to retail distributor. Rob, this is AWESOME stuff. Don't apologize for double posts we're happy you are here. I've purchased both myself, but haven't opened them yet. My wife put them away as birthday gifts for me (my BD is in November), since I'm "hard to buy for". So thanks for showing me what I'm missing! This is a great review MaximumRD. I'm so disappointed the controllers don't work with the original systems! How marvelous that would have been! Hey Scientist, so happy to see you posting! I'm disappointed about the controllers too, that was a cheap shortcut they took, I guess at the last minute to get them out on time. You can get them rewired though and they'll still work. The Coleco controller actually feels a lot better imo than the originals. Nice review. I'm also disappointed about the controllers, I was hoping to have new controllers for Coleco. Oh well. And I never understood the whole Intellivision thing. The games that weren't Atari knock-offs were pretty weak, and that control pad was just unplayable. But that's just my 2c. Really Octagon?? That's harsh. True to an extent, but harsh. I always liked the Intellivision. They were the underdog and they made some pretty cool games. Diner comes to mind. I'm very excited about Advanced Dungeons & Dragons too, greenween! I used to confuse that game with Quest for the Rings so I always thought it was on Odyssey 2. AD&D both 1 and 2 are both great games. Don't tell the Intellivision guys, but I agree that the controller is just terrible. I don't mind the disc as much as the side buttons. It will be interesting to see if the flashback improves the controller at all. I was looking forward to getting these but won't for two simple reasons. joysticks don't work on the original systems and no licensing for pitfall. those are dealbrakers in my book. I picked both of these up a few weeks ago. I've tried them both out, and I gotta admit I like the Colecovision better (please don't hate me). That's not to say the Intellivision isn't as good. Funny you should mention rewiring the controllers. I ended up taking the coleco controller apart to tinker with it. Haven't gotten very far though. If I'm able to get it working on the original, you all will be the first to know. coleco is better than intellivision always is always was. Intellivision had some okay games, the sports games were good at the time but they dont hold up well. Coleco games hold up better because theyre arcade classics and still fun to play. I have to agree the controllers on intellivision are cruddy. Coleco didnt have the best controllers but they were better than anything out at the time. Well, I finally got mine! Happy birthday to me. I've only opened the Colecovision Flashback so far. Love it. The controllers are GOOD. Smaller than the originals, and the stick is less stiff. Big improvement. Good game selection. No Donkey Kong! But Frenzy. Got stuck playing Frenzy. The rest will have to wait until later. That game is fantastic. I do have a problem though. With most of the flashbacks I've tried...my LCD just doesn't like them. The picture is kind of jittery. I'll just have to play on a smaller TV. I have been asked quite a bit about my own thoughts and impressions since doing my Colecovision and Intellivision Flashback unboxing video. Damn crazy views I got on that one compared to my usual numbers. Anyway, I just have not had the time or opportunity to plug my own back in BUT I can tell you from the info I have seen from others videos and comments etc, I will offer this: Colecovision FLASHBACK: Sadly, the controllers are not interchangeable with the original ones, they were originally suppose to be but a last minute decision (likely to meet a quicker release ) changed that. The emulation is even worse than on the Intellivision Flashback. One real example is THE HEIST by Microfun on the Colecovision flashback pretty much running at 1/2 the original speed UGH! Not only does that kill the once fun and bouncy music but it kills the pace of the game, that is the worse of it though, the rest play OK. If your expectations are not too high (IE: you are not expecting a perfect representation of the original games) for the casual retro gamer just looking to quickly and conveniently relive some Colecovision fun it is not too bad a deal. Note also a dude on Atariage offering a sticker set helping this unit look much closer to the original design of the Colecovision which is nice as AtGames seemed to put less effort in this area than they did for the Intellivision Flashback. That said my original Colecovison, accessories and 128in1 cartridge isn't going anywhere. Intellivision Flashback : Same issue with the controllers not being interchangeable with the originals (though a dude on Atariage offers adapters to fix this issue allowing you to use the Flashback controllers on original Intellivisions) Games play a little better than compared to the Coleco FB however a true fan will still notice some quirks especially in the audio department compared to the original but nothing too drastic. Again, for the causal player just looking to plug n play for some Intellivision fun not too bad a deal. I DO hope to get some time to myself to actually hookup and play to demonstrate for you all personally some of what i have reported here. Don't wait for me if you are on the fence for either of these though as you can find plenty of videos demonstrating all the new Flashbacks that are very thorough. Bottom line, these are not for the "purist", you guys can just stick to the original but the price point and all the included games means it is really marketed to those that had one as a kid and passes by seeing it on the shelf and they think "HEY! I remember having a Colecovision / Intellivision, this looks cool!" it is NOT for those who have the original hardware / games unless you are the type of collector who just has to have everything regardless or just want as a conversation piece etc. Had the games played more accurately or the controllers been compatible with originals right out of the box it would have been a no brainer, as it stands though you can decide if it is worth it for yourselves. I was playing more with the Colecovision Flashback today and noticed wrong sound effects while playing Zaxxon. And then Squish-em Sam -- no voice synthesis! Well, that was enough for me, I boxed it up and returned it. Intellivision unit as well without even opening it. If it isn't authentic, I don't want it. If the controllers worked with a real CV or INTV, I might have kept them just for those. But nope. Back to the Loch with ye, Nessie. Good write-up, Max! This is another case showing that nothing beats the real deal. Personally, I like my CV and IV Flashbacks. My first exposure to their games, ever. I've played the hell out of Pepper II and Astrosmash... Fun stuff. They may not be perfect, but for my needs, they serve their purpose quite nicely. I really enjoy Thunder Castle, and Night Stalker, and Frenzy from CV is amazing, but tough as nails. And I thought Berzerk was hard. In all, I like my Flashbacks, and they get a lot of use. I bought 2 CV Flashbacks last Thanksgiving morning at Dollar General because they were on sale. I gave one to my 5 year old nephew for Xmas and the other I tossed up on a shelf to sit next to my Atari Flashback that I never opened. I'll save the CV Flashback for the day when I no longer have access to a working Colecovision. INTV flashback is pretty good, INTV had the benefit of having lots of their best games being in house titles, so there weren't many licensing issues. The notable exceptions being the Tron titles. Unlike AD&D where they could just change the name, Tron games had the ol Recognizer and other elements that just couldn't really be erased. The worst thing about the INTV flashback is that one of the best games (Tower of Doom) is glitched and unplayable. Bad form. Colecovision flashback I think suffered more from the licensed title issue because of it having such a great arcade port library. I didn't play all the titles, but I spent hours on Apshai, which they got perfect! Considering a working Colecovision is the hardest to find (most expensive) of the big 3, its not a bad deal for a casual nostalgic gamer. The original Atari flashback was pretty bad in my opinion, but the Flashback 2 is good stuff. Nice library that includes Pitfall and River Raid. Can't beat that. I really enjoyed the videos, even after the fact! wonder what Atari FB 6 and INTV FB 2 has in store for us this Christmas? Thanks for the write up on these systems guys. I of course have the CV flashback, but not the INTV one. I always wanted a Colecovision, but never got around to getting one (yet), but I had a friend when I was a kid who had the INTV and I just never liked anything about it. I hated the disc controllers, I hated most of the games, they all seemed "generic" to me in some way when I was younger. The only game I ever loved on the systems was an overhead racer that was called (at least the Atari 8-bit version) Rally Speedway. I love that game even more on my 1200XL with good controllers. So I'm definitely not interested in ever getting the INTV FB or original (sorry to you fans). 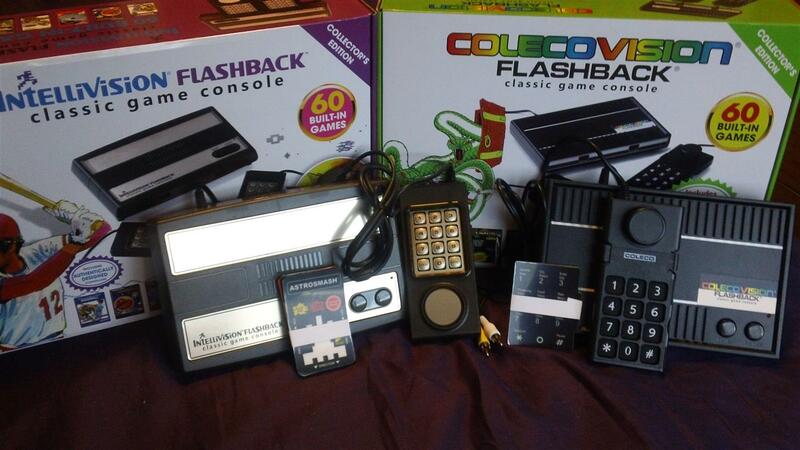 The Colecovision FB I haven't been impressed with much either. Firstly, as stated before, many of the games on CV FB, especially Zaxxon, just seem a lot clunkier with "chunky" movement, animation and scrolling than their 800/5200 equivalents. And I did chalk this up at first as possibly being due to emulation. but then I searched and posted video examples of CV/5200/A8 versions of Zaxxon from YouTube, and Zaxxon STILL had terrible scrolling in those videos. But, maybe those videos where done on PC emulators with similar issues (though most emulators today actually let you match speeds or increase them, so I'm not sure if that's an excuse). But, Since MaximumRD has reported that indeed there are emulation problems with the CV FB, I am now inclined to get a real Colecovision once again, so thanks for that. The other thing that I hate about the CV flashback is the game selection, as stated, a licensing problem, but some of the titles they chose are just boring and worthless to me and seem like they should be on an old Apple II or Vic-20, not Colecovision. Titles like The Search for the Stolen Jewels 1-3, Shunting Puzzle, Rolloverture, Fortune Builder, Bankruptcy Builder, etc., etc., etc., etc.,...don't belong on a video game console, IMO, real or flashback! So I'm left with (apparently) shoddy emulated versions of REAL video games and only half the titles vaguely interesting me. VERY DISAPPOINTED. So to heck with Intellivision all together (again, sorry to INTV fans), and to heck with Colecovision Flashback, I need the real thing! Even one of my favorite systems, the 7800, I avoided like the plague with the original Atari Flashback 1 due to hearing it was all emulated. I should have done the same with Colecovision Flashback. Only my Atari 2600 Flashback 2, with a real version of the hardware, have I been happy with. I'm done with emulated consoles for good. I'll stick t tracking down the real classics. Time to get another REAL 7800, 5200, and a REAL Colecovision...and of course a Turbografx 16! Use the REAL Force, Luke! And to all Colecovision fans, I promise to refrain from further judgment until I try the REAL COKE! Err...thing, the real thing, Coke...err Colecovision. I'm with you Bakerman on avoiding "emulated" flashbacks. Nothing compares to the real deal running real software. I initially bought the CV flashback when it first came out, and returned it when I saw how bad the sounds were compared to the real thing. I do have one now...having bought it on clearance sale, and am happy with it at that price. I assure you that the CV is a great system. Yes, Zaxxon is a clunker. But have you ever seen "Turbo"? Or Jungle Hunt. Or Looping? There's a lot of great scrolling games. And non-scrolling games like Frenzy, Frogger, Burgertime, Pepper II that are really good. Better than 5200? I'd call it a tie. Both are good. Both have flaws. You can have fun on either. I am fine with my CV FB for now. From what I can gather, a real CV in perfect working order is a bit over my limited budget price-wise. The FB is an acceptable compromise, as far as I'm concerned.